Hockey India on Tuesday named senior goalkeeper PR Sreejesh as the captain of the national team for the Rio Olympics, removing long-time skipper Sardar Singh. 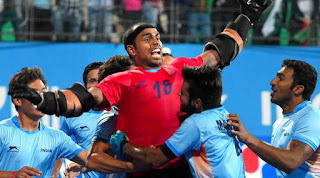 Sreejesh, one of the finest custodians in world hockey at the moment, was rewarded after the team, under his leadership, ended up with a silver medal at the blue riband six-nation Champions Trophy hockey tournament in London. Sreejesh had a good tournament both as a player and captain as India had their best performance in the 38-year-history of the tournament. The team played a brilliant final where they held eventual champions Australia to a goalless draw in the regulation time before losing in a controversial shoot-out. Sardar has been the captain of the national team for a number of years having led the team in London 2012.